I first heard about Nutella 10 years ago when I working in a lab with two Swiss scientists. Both would tout the merits of something called Nutella and how it was superior to American peanut butter. Their comments never bothered me because everyone is entitled to their own opinion and they usually took the extreme view just for the sake of argument. Sure, they preferred Nutella to peanut butter, but everyone has preferences. Later, one scientist mentioned to me that peanut butter wasn’t entirely gross. Coming from him, "wasn't entirely gross" is pretty much the equivalent of a compliment. So I secretly declared victory for peanut butter. I don’t know how a chocolate hazelnut spread like Nutella can even be compared to peanut butter. They are completely different. It’s like comparing apples and oranges. They both have their place in the kitchen. But it wasn’t until recently that they co-existed in my kitchen. I bought my very first jar of Nutella a few months ago. A recipe for self-frosting Nutella cupcakes was floating around the food blogosphere so I had to try it. Fast forward 3 months later and I still had that same jar sitting around in my cupboard. So I was determined to finally use it up. Taking inspiration from various chocolate cookie recipes I’ve baked over the years, this Nutella cookie was born. I was so pleased with the results that I actually bought a Costco sized jar of Nutella yesterday. 7 tbsp unsalted butter, at room temp. Sift together flour, cocoa, cinnamon, baking powder, baking soda and salt. Set aside dry ingredients. Cream together butter, granulated sugar and brown sugar until light and fluffy. Mix in Nutella and vanilla extract. Mix in egg. Add flour mixture and mix until just incorporated. Add chocolate chips and hazelnuts. 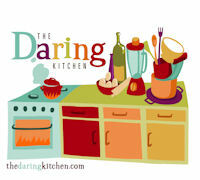 Drop tablespoons of dough 2 inches apart onto parchment lined baking sheets. Bake for about 11 minutes until the edges look set. Cool on baking sheet for 5 minutes then carefully remove to cooling racks. I had some leftover dough from my peanut butter and jelly bars. I probably used too little of the dough for the bottom layer and therefore I was left with too much for the top layer. 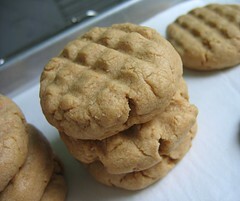 Instead of making my bars "top heavy", I saved the extra dough and made peanut butter cookies. My tiny garden is bursting with dahlias right now. 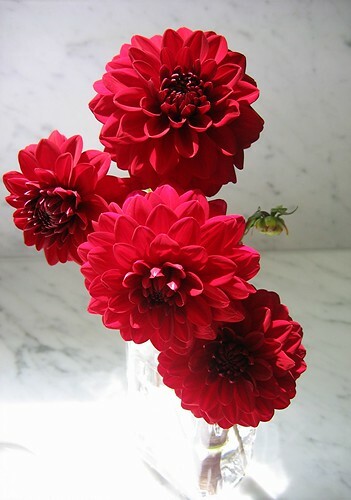 Did you know that the dahlia is the official flower of San Francisco? Mary, I absolutely love the way the world turns and sometimes we turn with it - nutella really isn't like peanut butter and can't take it's place. Likewise, Peanut butter will never take Nutella's place. Love that you put the two side by side - that is the natual order of the universe! And your dahlias - awesome. I hope you have that sitting where your eye wonders over them often. Gorgeous cookies, Mary! There's no way a jar of nutella would last 3 months in our house so I'm glad you bought the Costco-sized jar! ohh yum I love nutella !!! Yes, Nutella and peanut butter aren't really the same, but if they had to fight, Nutella would be the clear victor! I love the stuff and go through jars of it on a weekly basis, ok, that's a bit of stretch. I'm glad you tried it and have been converted to the jumbo-size. And the cookies look great! These look great! I think my brother would really like these as long as I didn't put the actual hazelnuts in there. He doesn't like nuts in anything but LOVES nutella. Wow! Those look great! I never would have thought of Nutella cookies. I LOVE Nutella so much!! Tanna - I spend so much time in the kitchen, so that's where I like to put my cut dahlias. Ivonne - Now that I have the Costco sized jar I'll be looking for more ways to use Nutella. Clarice, Natalia, & Wheresmymind - I'm quickly realizing that there'a huge Nutella fan base out there. Claire - It's funny that he likes Nutella but doesn't like nuts. Rachel - If it wasn't for food blogs, I would've never heard about the Nutella cupcake and then I would've never made a Nutella cookie. I love nutella - these cookies sounds perfect! Ah ha ha, the Swiss boys! Whatever happened to them?! Nutella rocks! And so do your cookies! Wow! I really want to try those Nutella cookies. Orlena - It's been a while since we've seen the Swiss boys, huh? I heard they moved to SD. Dani - I hope you try making them. Thanks, Mary. I just found your beautiful site and this recipe that I must try. I am as yet a Nutella virgin. I'm not even sure I can get it locally, but I've been on the lookout. The problem with Nutella is that it is EXTREMELY high in saturated fat. I know how unfair it is! But it is almost like eating butter. Have a look at the ingredients label. I am very sorry to say this because I love it so much and wish it was a health food. Right now I do not dare touch it. Or have it in the house. :( My wife feels the same way. Mary, thanks for visiting my blog. And btw, I´m very impressed that you could keep a jar of Nutella in the cupboard for so long! Hi from Omaha -- I confess to having a jar hanging around the cupboard for a couple of months as well -- It's Dec and cookie season so I googled nutella cookies and found this recipe. I love it -- hope there's some left for the family when they get home. Jan - Hello Omaha! These are great cookies for the holidays. And they keep well too (if people don't devour them all right away!). Thank you for that recipie...I love nutella, and the other recipie I have called for shortning....Thank you so much, I can't wait to try those cookies! Hi there,I just tried your nutella cookies,they turned out great.I wasn't sure at what temp to bake them,but anyways they're delicious.Thanks for inventing it. I only recently tried Nutella, and I'm now obsessed. 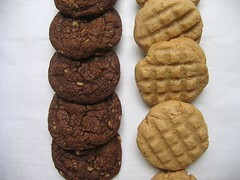 I've been looking for a good cookie recipe, and these look wonderful. I'm definitely going to try them. Thanks for the recipe! Hello! I tried your Nutella cookies and they were wonderful. I had a jar of Nutella at home that I wanted to finish off (but didn't want to eat with toast) so your recipe was perfect. Nutella is too sweet for me but the cookies were not diabetes-inducing. And my family loved them too. They usually complain when I make four dozen cookies but this time they just ate them all. Thanks so much. I am going to try your oatmeal toffee cookies soon! Me living in Sweden made me translate cups and whatnots, but oh boy was it worth it! Cookies on the cooling, thanks for a great cookiedough! Thanks for the Nutella cookies recipe. I just made them and they are delicious!! I did add an extra tablespoon of butter because the dough was just a little tough to work with. But sooo yummy!! 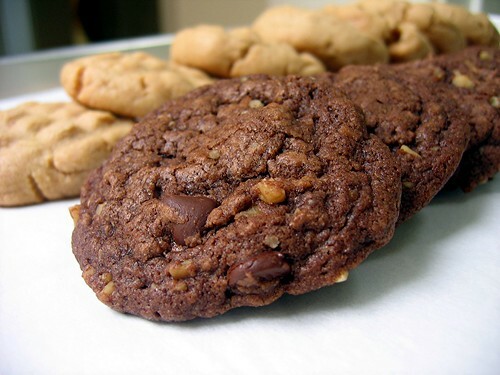 This Nutella cookies look great .. crisp, rich in flavor and taste. I am going to bake a batch of these melt in the mouth cookies. hey, I am going to be baking this now! Hoping for the best. Thanks for the post. Can't wait to get baking. Jessica - Glad you like the recipe. yummy nutella is soo good! and im sure these cookies will be very yummy too! so i was looking for a recipie to use up my nutella and i found this one. i loved the cookies. well thin i looked through your other recipies and they looked great. thank you sooo much. just baked these- they are fabulous! i substituted pecans for hazelnuts.